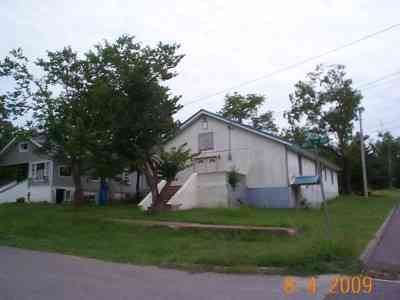 COMMERCIAL BUILDING (CHURCH) FOR SALE OR LEASE. ENTRY FOYER, SOME CLASS ROOMS AND PARTIAL BASEMENT. GREAT BUILDING FOR A SMALL COMMUNITY CHURCH, MEETING HALL OR COULD BE CONVERTED TO A NICE HOME. OWNER WILL CONSIDER FINANCING! HAS SOME PEWS, AND MISC BOOKS STILL THERE FOR YOUR USE. HEATS WITH GAS VENTLESS HEATER AND COOLED WITH WALL AC UNIT. BAPTISTRY LOCATED AT FRONT BEHIND WHERE PODIUM GOES. ROOM OFF ENTRY WOULD MAKE A GOOD NURSURY (HAS GLASS WINDOW SO YOU CAN SEE THE SERVICES WHILE ATTENDING TO THE LITTLE ONES).